OCCA conducts a broad spectrum of programs and participates in events related to water quality, land-use management, energy conservation, and recycling. Volunteers are essential to the accomplishment of our mission-related activities. Their contributions of time, talent, and caring make a positive difference in regard to our local environment and environmental awareness. Volunteers set an example for others in the community to follow. At OCCA, volunteers are needed for activities such as Household Hazardous Waste Day, the annual OCCA garage sale, bulk mailings, leading a hike, canoe trip, or cross-country ski outing, maintenance of Basswood Pond Trail, library book recycling efforts, our annual dinner and meeting, and catering for certain OCCA meetings and events. Household Hazardous Waste Day, September 8 – Help direct traffic, paint recycling, breaking down boxes. 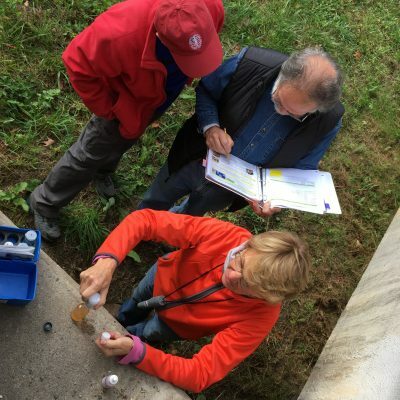 Stream Team Water Quality Monitoring, Ongoing – Sign up to monitor water quality in Otsego County’s streams. Training is September 21. Water Chestnut Paddle and Pull, August 4 – Paddle beautiful Goodyear Lake and find water chestnut to pull from your canoe. Highway Cleanup, Ongoing – OCCA helps take care of a stretch of State Route 80 in front of our offices in Cooperstown quarterly. To become a Volunteer, click here to sign up or contact our office at (607) 547-4488! Check boxes for all interest areas.